If you are looking for a new online casino then take a look at the brand new Euromoon Casino where the games and promotions on offer are sure to send you over the moon. The casino offers games from NextGen Gaming and Betsoft Gaming. Players will find a huge collection of video slots and 3D slots, card and table games such as poker, roulette and baccarat, video poker titles, scratch cards, keno games and more. There is also virtual sports betting available and a huge number of the site’s games are linked to progressive jackpots. 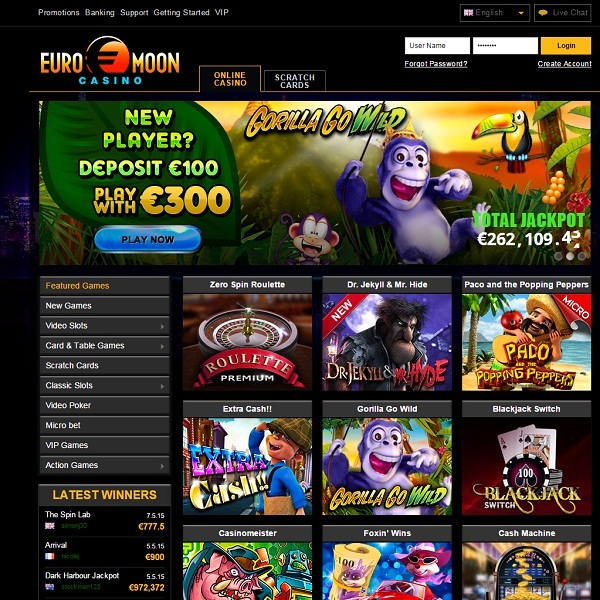 New members of Euromoon Casino will receive a 200% first deposit bonus of up to €1000 after signing up. There are then 15% bonuses available on every subsequent deposit. The casino also runs a loyalty scheme which offers cash rewards and further bonuses.